Where Have You Gone Lou DiMaggio? From 1985 to 1989, Lou DiMaggio (no relation to baseball legend Joe DiMaggio) was a regular at the iconic Catch a Rising Star comedy club in New York City. For four years, Lou worked alongside of and made lasting friendships with a small group of comedians who are today some of the very best in the business. Larry David, Colin Quinn, Suzie Essman, Joy Behar, Jeff Garlin, Ray Romano and Howie Mandel are just a few of Lou’s old pals who appear in the film. After moving to Los Angeles in 1989 to pursue acting, Lou stopped doing stand-up comedy forever. Today Lou is an Emmy-winning writer for television. He makes a quiet, modest living, but a deeply repressed passion for doing stand-up is beginning to emerge from Lou’s comedy hiatus. 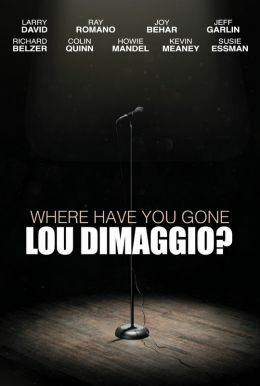 Where Have You Gone Lou DiMaggio? follows Lou as he seeks advice from his celebrity friends about his return to comedy. Can Lou rediscover his comedic voice and once again become relevant in the world of comedy?